Dennis Conrad started it all nearly a half century ago when he was working toward a merit badge in scouting. Later in life he inherited a flock of chickens that had belonged to a friend that had been raising them for their hackle. The blood line of that flock had been developed for over 40 years and Denny continued that line for the next several years. Operating under the name of Conranch Hackle, Denny and his daughter Liz sold premium hackle to the fly fishing community. Careful breeding and selection is what made Conranch Hackle special, and their hackles were always in high demand by those fly tyers that demanded only the best. In 2012 Denny and Liz decided that it was time to spend more time fishing and less time feeding chickens and selling hackle. They found a buy in the Lars Benson family. Operating under the name of Clearwater Hackle they intend to continue the tradition of offering the finest hackles available for the fly tying community. Clearwater Hackle is a family-run business located in the heart of the Rocky Mountains. We specialize in feathers for the fly tying community, with a special emphasis on dry fly hackle. Our flock comes from the famous Conranch Hackle line and is believed to be the oldest pure strain of Darbee-selected chickens in the world. Developed over several decades by Denny Conrad we are able to continue to produce hackles of unsurpassed quality. We have a full range of natural colors and our hallmark is our five-colored Cree, which is unique to Clearwater Hackle. Quality products, great service and affordable prices are our goals. Satisfaction is guaranteed. 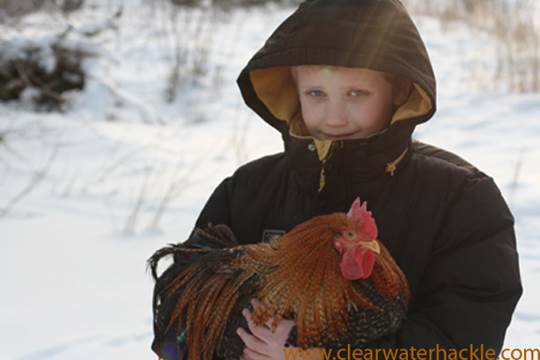 Contact us today a www.clearwaterhackle.com for our current selection of quality hackle.